Beer is made of four simple ingredients: barley, water, hops and yeast. Whiskey, only two: barley and water. Craft brewers and distillers can regionally source these raw materials, and through the miracle of fermentation, create beer and spirits with unique flavor profiles and a distinct taste of place. Public and private groups are joining forces to redevelop the old brewhouse. Scotch Whiskey and Champagne are great examples of this idea of taste of place, or what the French call terroir, which refers to the effects that the local environment has on the production of food or drink, and assumes that the land from which say, grapes, are grown imparts a unique flavor and quality that is specific to that region. Now, consider this — Washington State’s Yakima Valley is home to one of the most fertile and productive hops growing regions in the world. In addition, west of the Cascades is experiencing a resurgence in growing local and sustainable grains as evidenced by the Cascadia Grains Conference, which raises energy around rebuilding our local grain economy for artisan baking, animal feed and craft brewing and distilling. The abundance of locally grown grain paired with a Washington State law that requires a minimum of 51% of raw materials be used in craft distilling are Washington grown equals an explosion of craft brewing and craft distilling in our region. According to Dr. Lucas Paztek, director of the Washington State University Thurston County Extension office, Washington State is home to more than one-sixth of the craft distillers in the United States and ranks eight in the number of craft brewers in the country. Imagine a place where education, research and new jobs are all created in the old brewery site. John Doan, City Administrator for the City of Tumwater, is excited about what the remarkable growth of craft brewing and distilling may mean for Thurston County, and believes there is incredible opportunity in the proposed transformation of the former Tumwater brewery site into an economic hub through the creation of a Craft Brewing and Distilling Center, news of which was released to the public in May. “We talked to the folks at the WSU extension and at the WSU Food Science Program, who do research around grains and brewing. We talked to South Puget Sound Community College who’ve been thinking of brewing and distilling in terms of workforce development. We talked to the Port of Olympia who is interested in economic development. We spoke with the Olympia Tumwater Foundation about the potential for a museum. What really brought us to this point is examining what we have that makes this unique; incredible brand equity in the brewery and the phenomenal growth in craft brewing and distilling,” he said. The center would have numerous uses and partners, with the goal of drawing investment, fostering innovation, creating jobs and attracting tourism. 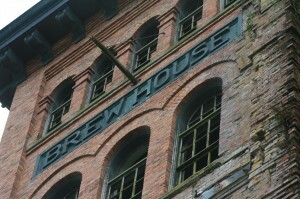 Olympia Brewing Company was owned by the Schmidt family until the 1980s. 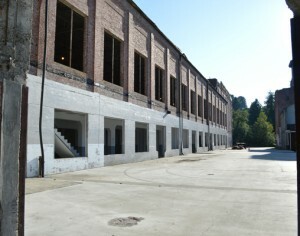 Redevelopment of the Tumwater brewery site would not only reinvigorate a site that has historical, cultural and community value, but would contribute to regional employment, and the local economy, according to the press release issued by the City of Tumwater. “Our community would really like this initiative to be a success. Our partners are committed to success as well as the private property owner. The public’s response to the announcement of the initiative has been amazing, not only in terms of media, but I’ve been contacted by a number of distillers and people interested in brewing,” said Michael Matthias, Brewery Redevelopment Project Manager. WSU’s involvement could mean research beyond craft and distilling, though the discussion is preliminary. “Our crop breeding programs and food science programs might fit in with this project. Steven Jones, the director at WSU Mount Vernon is already working with craft brewers. We are also exploring food aspects such as sauerkraut and cheese; both use fermentation science that could be part of education programs. I can help bring workshops to our area to build up sectors such as farming, distilling and brewing,” said Patzek. Add up what these partnerships mean: education, research and jobs, and a picture of what the former brewery could look like forms. Imagine evening and weekend brewing and distilling classes for people interested in creating their own products. A museum that celebrates the heritage of the site. 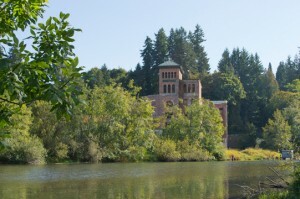 Walking trails that connect Tumwater and Olympia. A river walk along the Deschutes. Incubation space where folks who are now brewing beer in their garage could come in for two weeks and brew using state of the art equipment, and the same for craft distillers. Add to the mix an anchor tenant interested in education and research, tasting rooms where the public sample beer or whiskey. Ultimately, a center of excellence is created that celebrates the artisan craft of brewing and distilling, sustainable agriculture and a taste of place that is uniquely Washington.